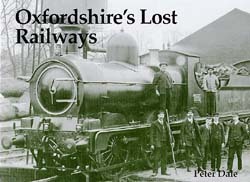 The first public railway in Oxfordshire, opening in June 1840, was the Great Western main line which entered the county near Goring. Thereafter the Great Western was the dominant railway force in the county, absorbing all rivals. One of these was the London & North Western's Oxford, Worcester & Wolverhampton Railway (which offered a poor enough service to become known as the 'Old Worse and Worse'!). This book details the history of all the county's lines, from their Victorian heyday to the Beeching cuts of the 1960s. Many lines were lost, but ironically the one that bucked the trend is the London & North Western, its lines to Oxford and Islip reopening in 1987 and 1989 respectively. Stations featured among the book's 52 photographs are: Kelmscott & Langford, Launton, Oxford Rewley Road, Chipping Norton, Thame, Blenheim & Woodstock, Eynsham, South Leigh, Witney, Brize Norton & Bampton, Carterton, Alvescott, Sarsden, Rollright, Hook Norton, Bloxham, Adderbury, Banbury Merton Street, Morris Cowley, Horspath, Wheatley, Tiddington, Chinnor, Kingston Crossing, Aston Rowant, Lewknor, Watlington, Yarnton, Bletchington, Fritwell & Somerton, Cropredy, Blackthorn, Ardley, Port Meadow, Oddington, and Wendlebury.